The Far East’s vast stretches of snow-covered lands introduce Boucheron’s latest High Jewellery collection: Hiver Impérial. Boucheron’s history is tightly linked to Moscow, as the jeweller was the first one to open a boutique in Moscow, in 1897. The Russian region serves three main themes for this collection – Nature, Couture and Architecture. Lumière de Nuit evokes the North’s breath-taking white polar landscape, with its brilliant white light. Femmes Boréales is all about the strong women in winter times, imagined as contemporary princesses and queens embraced by raws of pearls and precious gems. L’Anneau d’Or brings an helicopter view on rooftops, cupolas and onion domes of Russia’s ancient towns. Unveiled in a fairy setting in Paris, during July’s Haute Couture week, Boucheron’s Hiver Impérial High Jewellery collection brings to life suggestions of a winter-set wonderland, through the magic sparkles of diamonds, pearls and precious stones. The first chapter, Lumière de Nuit, links to Nature, to its mysterious side in an icy polar night. It is all about snowflakes, cascading spinels and a pack of Animaux des Neiges (Snow Animals). Snowflakes like in the Flocon Impérial Necklace, a creation that continues a tradition that began in 1898, the year in which Boucheron used snowflakes motif in high jewellery for the first time. Necklace set with a 5.20 ct E VVS1 cushion diamond and rock crystal, paved with diamonds, on white gold. Necklace in the tradition of the multi wear. In 2017, the clear beauty of snowflakes is interpreted by the naturally clear rock crystal, and the set diamonds viewed through the crystal seem to float, reflecting a unique light and giving this piece a strong yet almost impalpable character. The Flocon Impérial Necklace is a perfect example of transformable jewellery, and it presents seven detachable parts: a 5.20 carat diamond ring, a pair of earrings, a fibula and hair accessories – as a full set, each piece can truly be adapted and suit every mood and outfit – with the necklace featuring a fluid linked and multiple clasps that are extremely lightweight and make this jewel comfortable to wear. Boucheron – Hiver Impérial High Jewellery Collection Flocon long necklace Pendant set with a 0.75 ct E VVS2 round diamond and mother-of-pearl, paved with diamonds, on white gold. Boucheron – Hiver Impérial High Jewellery Collection Flocon Ring Ring set with a 0.70 ct D VVS2 round diamond and mother-of-pearl, paved with diamonds, on white gold. Necklace set with a 8.06 ct E VVS2 emerald-cut diamond, onyx and black lacquer, paved with diamonds, on white gold. Boucheron Hiver Impérial High Jewellery Collection Feuille Brooch Brooch set with a 0.55 ct oval diamond, paved with diamonds, on white gold. Boucheron Hiver Impérial High Jewellery Collection Branche Brooch Brooch set with wood, paved with diamonds, on white gold. Boucheron Hiver Impérial High Jewellery Collection Liseret Ring Ring set with a 6.03 ct D VVS2 emerald-cut diamond and black lacquer, paved with diamonds, on white gold. Boucheron Hiver Impérial High Jewellery Collection Epure Tourbillon Loup In white gold, diamonds, aventurine glass, obsidian and mother-of-pearl. Alligator strap. Flying Tourbillon movement. Boucheron Hiver Impérial High Jewellery Collection Laïka le Husky Timepiece In white gold, diamonds, sapphires, spinels, rock crystal and agate. Boucheron Hiver Impérial High Jewellery Collection Ladoga Ring Ring set with black sapphires and wood, paved with diamonds, on white gold. Boucheron Hiver Impérial High Jewellery Collection Laïka Ring Ring set with a 31.21 ct Burmese light greyish-blue antique cushion sapphire, grey spinels and sapphires, paved with diamonds, on white gold. Boucheron Hiver Impérial High Jewellery Collection Foxy Ring Ring set with a 7.28 ct green pear-cut tourmaline and emeralds, paved with diamonds, on white gold. Boucheron Hiver Impérial High Jewellery Collection Oulu Ring Ring set with yellow sapphires and black lacquer, paved with diamonds, on white gold. Boucheron Hiver Impérial High Jewellery Collection Ajourée Arctique Timepiece in white gold, diamonds, rock crystal and sapphires. Satin strap. 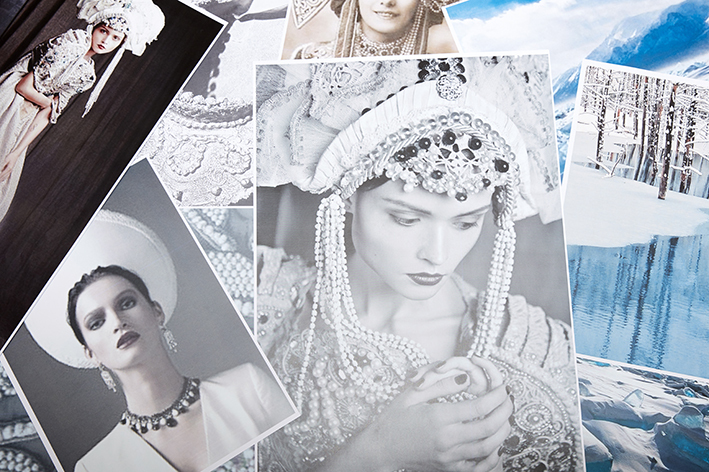 The chapter Femmes Boréales centres around the traditional Russian dresses and imperial jewellery, set with pearls, diamonds, precious stones – Russian-inspired queens evoked from the past and back to life with a contemporary touch. The centre piece of the chapter is the stunning Baïkal Bodice Front, adorned with more than 2000 Akoya pearls, strung on silk thread and connected with aquamarines, moonstones and diamond slivers that tie together the set. An impressive 78.33 carat oval Santa Maria aquamarine is set to recall the crystal clear blue waters of the Baïkal lake. The perfect ode to imperial jewels, it is decorated with pearls and pear shape diamonds set on moonstones. Necklace set with a 78.33 ct Santa Maria oval aquamarine, moonstones and Akoya cultured pearls, paved with diamonds and aquamarines, on white gold. Boucheron Hiver Impérial High Jewellery Collection Banquise Ring Ring set with a 5.33 ct F VVS1 oval diamond and cultured pearls, paved with diamonds, on white gold. Boucheron Hiver Impérial High Jewellery Collection Baïkal Earrings Earrings set with one 12.08 ct pear aquamarine , one 11.74 ct pear aquamarine and cultured freshwater pearls, paved with diamonds, on white gold. Boucheron Hiver Impérial High Jewellery Collection Joya Ring Ring set with a 19.92 ct sugar-loaf cabochon sapphire and diamonds, paved with diamonds, on white gold. Boucheron Hiver Impérial High Jewellery Collection Baïkal Ring Ring set with a 24.87 ct pear aquamarine and cultured freshwater pearls, paved with diamonds, on white gold. Pearls become main protagonist in elegant jewels that recall the haute couture style refinement. With Boucheron’s Hiver Impérial collection, pearls revive in a new and creative interpretation, like in the Pompon Necklace, a brand new version of the twisted chain, in mother-of-pearl and diamonds. Another masterpiece is the Nevesta Necklace, boasting an impressive 9.29 carat pear-shape diamond destined to become a new classic – all this framed in a graphic chain design that alternates baguette and round diamonds. Necklace set with a 9.29 ct D VVS2 pear diamond, paved with diamond, on white gold. Ring set with a 10.54 ct Zambia cushion emerald, paved with diamonds, on white gold. The third and last chapter, L’Anneau d’Or, reminds of the Russian imperial cities, and their rooftops, cupolas, onion domes – together with design elements from the Slavic Naryshkin Baroque architectural style of North-East Moscow, that inspire ultra-graphic necklaces, rings and earrings that bring back the colours of the northern lights on a winter’s day and on crystal-clear nights. The Rostov Necklace is a superbly executed medallion inlaid with wood and diamonds, to represent a dome as seen from above – series of intricate cutouts depict the superimposed roof tiles, reminiscent of the colours of domes in Rostov, glistening in the snow. Necklace set with a 4.14 ct E VVS2 round diamond and wood, paved with diamonds, on white gold. Necklace in the tradition of the multiwear. The medallion of the Rostov Necklace hangs from a chain with an invisible clasp that has various sizes of diamonds arranged to create a shifting light effect. The centre of the dome-designed disc hosts a round 4.14 carat diamond, and the piece can be worn in four different ways – as a long necklace, a double strand or chocker, with the medallion being also detachable and used as a brooch. With the Rostov Necklace, Boucheron brings wood back to high jewellery, and in the Hiver Impérial collection, wood is enriched by that silver patina typical of the wooden buildings weathered by the cold time in Russia’s Golden Ring. Other very important elements, in Russian architecture, are the Kokoshnik and the Naryshkin Baroque shapes. The Kokochnik, that often guides regal tiara designs, recall the Russian domes’ lines, and is the base for inspiration of the Kokochnik Necklace, a jewel that features a deeply intense 7.54 Royal Blue Burmese sapphire. while the matching ring is set with a 10.98 carat oval-cut Burmese sapphire. The rock crystal dome of the necklace encapsulates 20.31 carats of diamonds. Necklace set with a 7.54 ct Burmese Royal Blue cushion sapphire and rock crystal, paved with diamonds, on white gold. Ring set with a 10.98 ct Burmese oval sapphire and rock crystal, paved with diamonds, on white gold. Finally, the Naryshkin Baroque shapes guide the Marquetry sleek lines, interpreted by Boucheron according to two colour palettes – one in shades of blue, blue chalcedonies and mother-of-pearl, paved with diamonds, and the other is paved with onyx, diamonds and grey moonstone.